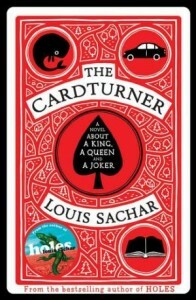 Louis Sachar, 2010. I grew up with Sachar’s Wayside School stories, and while his award-winning Holes wasn’t really my thing, I enjoyed it nonetheless. The Cardturner is more my speed – a coming-of-age story with a lot of esoteria around a card game. Alton is a teenage boy who works as a cardturner for his blind uncle, a bridge player; at the beginning of each hand, Alton whispers the cards to the uncle, and then the uncle tells him what to play each time. There’s a goofy subplot about former cardturners and a long-forgotten romance; in the middle, the uncle dies, but continues to direct Alton’s play from beyond the grave. Alton’s evil parents and awesome younger sister round out the picture. The bridge info is complicated but nicely presented, and I kind of want to learn bridge now. In the middle of the story, Alton attends a bridge lecture by a famous player, who presents example scenarios and asks the audience to figure out what card to play. “If you guess right, you can marry the princess,” he says to the men; he changes it to “prince” for the ladies. One woman guesses correctly and he offers her the prince. “I’ll take the princess, if you don’t mind,” she says. That’s it. This entry was posted in 2010, fantasy, lesbian, Louis Sachar, passing mentions, problem novel, queer adult, realistic, romance. Bookmark the permalink.